Kuranda Beds - Petfinder Members. We are excited to announce an exclusive discounted pricing program for Petfinder members on Kuranda dog and cat beds at an approximately 35% savings. There are no restrictions regarding quantities or numbers of beds placed for your shelter or rescue under this program. Kuranda Dog Beds are the number one choice of shelters and rescues because they are sturdy, comfortable, chewproof and dramatically reduce the laundry load. The non-porous materials are easily sanitized with bleach or disenfectant. Dogs enjoy the comfort of the raised bed which gives them a soft and dry place to relax off the floor. The fabric is tucked inside the frame so there are no exposed edges to chew and Kuranda beds are backed with a 1 year replacement warranty. Kuranda Bunk Beds are the perfect solution for limited floor space for multiple dogs. They can enjoy the orthopedic comfort from the top dog view, or the security of the lower bunk. The bunks, which are a little higher with each bed size are specially designed at optimum shoulder height for dogs to jump onto. The Cat Bed was especially designed to fit into standard 24×24 or larger stainless steel cat cages. The elevated bed increases floor space in the cage giving cats the opportunity to jump up to a private perch. The long legs accommodate a litter pan underneath or a cozy place for a shy cat to feel secure. The Kuranda Cat Tower comes in heights from 2 to 9 tiers to provide exercise and stress relief for cats in community areas. The staggered levels provide cozy nooks that help provide privacy and reduce conflict between cats. The tower is designed with more weight at the bottom to keep it secure from tipping. The 30″ width fits thru standard doorways. As with Kuranda dog beds, the cat beds and towers are made of a sturdy PVC frame and solid vinyl fabric that is non-porous and can be fully sanitized with bleach or disinfectant solution. Join thousands of shelters and rescues getting FREE beds for all of their dogs and cats! The Donate-a-Bed Program was created by the pet lovers at Kuranda as a means to help provide comfort to shelter and rescue dogs and cats. The program enables the public to easily send beds and cozy fleece pads directly to their favorite shelters and rescue organizations at discounted prices. When you sign up at www.kuranda.com/humane you will be added to Kuranda’s Donate a Bed page and get a direct link to post on your Petfinder homepage. You will receive sample media, custom designed seasonal graphics and Gift Cards to generate interest in donations throughout the year. 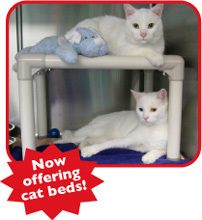 Also, don’t forget to put Kuranda beds on your shelter’s wish list. They have proven over and over to lower stress and provide the comfort of a soft, dry bed all dogs and cats deserve. *Add $7 for the “Hybrid Bed” which fortifies the pvc bed with aluminum top corners.